Crook County was named for Brigadier General George Crook, an army commander during the Indian Wars. 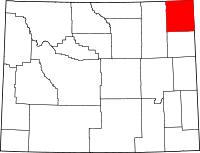 In 1890, Crook County lost territory when Weston County was created. Campbell County was formed with land ceded by Crook County in 1911. According to the US Census Bureau, the county has a total area of 2,865 square miles (7,420 km2), of which 2,854 square miles (7,390 km2) is land and 11 square miles (28 km2) (0.4%) is water. The lowest point in the state of Wyoming is located on the Belle Fourche River in Crook County, where it flows out of Wyoming and into South Dakota. Devils Tower National Monument is located in the Bear Lodge Mountains in Crook County. The Missouri Buttes, at the northwestern end of the Black Hills, are located in the county, 3.5 miles northwest of Devils Tower. As of the 2000 United States Census,  of 2000, there were 5,887 people, 2,308 households, and 1,645 families in the county. The population density was 2 people per square mile (1/km²). There were 2,935 housing units at an average density of 1.0 per square mile (0.4/km²). The racial makeup of the county was 97.86% White, 0.05% Black or African American, 1.02% Native American, 0.07% Asian, 0.25% from other races, and 0.75% from two or more races. 0.92% of the population were Hispanic or Latino of any race. 34.1% were of German, 14.6% English, 7.8% Irish and 6.8% American ancestry. There were 2,308 households out of which 32.30% had children under the age of 18 living with them, 62.30% were married couples living together, 5.40% had a female householder with no husband present, and 28.70% were non-families. 24.90% of all households were made up of individuals and 10.30% had someone living alone who was 65 years of age or older. The average household size was 2.51 and the average family size was 3.01. The county population contained 26.90% under the age of 18, 6.60% from 18 to 24, 24.60% from 25 to 44, 27.20% from 45 to 64, and 14.70% who were 65 years of age or older. The median age was 40 years. For every 100 females there were 102.40 males. For every 100 females age 18 and over, there were 101.80 males. The median income for a household in the county was $35,601, and the median income for a family was $43,105. Males had a median income of $34,483 versus $18,967 for females, indicating a relatively high level of income inequality based on gender. The per capita income for the county was $17,379. About 7.8% of families and 9.10% of the population were below the poverty line, including 9.90% of those under age 18 and 11.80% of those age 65 or over. Crook County is one of the most overwhelmingly Republican counties in the nation, both in state and federal elections. The last Democratic candidate to carry the county was Franklin D. Roosevelt in 1932,  and indeed Roosevelt in the following election – when he lost to Alf Landon by five percentage points – constitutes the last Democrat to pass forty percent. In the last ten Presidential elections the Democratic candidate has consistently received less than 23.5% of the county's vote. In the 2016 Presidential election, Crook County was the most Republican county in the most Republican state. ^ "2010 Census Gazetteer Files". US Census Bureau. August 22, 2012. Retrieved August 5, 2015. ^ "US Decennial Census". US Census Bureau. Archived from the original on May 12, 2015. Retrieved August 5, 2015. ^ "Presidential election of 1932 - Map by counties". geoelections.free.fr. Retrieved April 5, 2018. ^ "State of Wyoming Legislature|Ogden Driskill". legisweb.state.wy.us. Retrieved April 5, 2018. ^ "State of Wyoming Legislature|Tyler Lindholm". legisweb.state.wy.us. Retrieved April 5, 2018.